The official website of the Newton Police Department located in the Town of Newton in Sussex County, New Jersey. Due to the enormous popularity of Web and Mobile based apps, the Newton Police Department is now utilizing state of the art technology to receive crime tips. 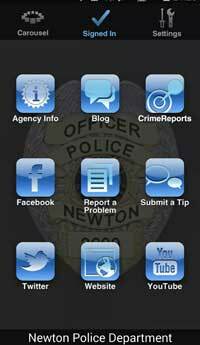 Citizens of Newton now have several options to securely submit crime tips to their local Police Department. These services are for reporting tips to aid in investigations, not for reporting crimes in progress. To report a crime in progress call 9-1-1! Use this online form to submit tips about crimes or other suspicious activity. Tips submitted through this website are encrypted, entirely confidential, completely anonymous and are immediately and securely transferred directly to police. After submitting your tip, you will be provided with your own unique ID number that you will use when checking the status of your tip. TipSoft SMS is a service which allows 100% anonymous crime tips to be submitted to the police via text message. The technology routes messages through a server that encrypts cell phone numbers before they get to police. No one will know the identity of the text tipster. The technology also allows investigators to securely reply back to the cell phone without compromising the tipster’s identity. For example, text “NEWTON John Doe is selling drugs at describe location or vehicle“ to CRIMES (274-637). Download our app today for Android or iPhone. © Newton Police Department. All rights reserved.